Ballgame. Kurt Crain. Holy flourishes of CBS synthesizers. 1987 Jim Lampley sounds his horn and the Crimson walls come down. My mom’s friend recorded it for us and put the tape in the hardest, most protective, most perfectly labeled VHS clam shell you’ve ever seen and I watched it over and over again. It was a morality play with “Falcon Crest” commercials. It was my background music. It was my Saturday morning. It was my Saturday night. I have it memorized. I was there. It was my first. I was 8. It was time. Dad. Legion Field. Birmingham. Baptism. Good. Evil. Good kicks a field goal to go up by 10 with, like, a minute and a half left. Evil hasn’t even scored–but Evil has the ball. “For freshman quarterback Jeff Dunn, this will be the biggest moment of his life,” and the biggest moment of Jeff Dunn’s life, the biggest moment of an Alabama quarterback’s life, is about to end in failure, it has to, I just know it. God knows it. And Kurt Crain knows it. And so it did—“A final disheartening blow for Alabama”—and many lessons were learned. For freshman quarterback Jeff Dunn, don’t throw over the middle to a guy with the most Clay Whitehurst sounding name ever when you’re desperate to stop the clock. For me, don’t celebrate the death of an opposing team’s player. And I truly thought Clay Whitehurst was dead, and with him, any chance of Evil winning. I shouted! I cheered! Ding Dong! Kurt Crain! When I think of Auburn linebackers, I think of Kurt Crain. When I think of Auburn people, I think of Kurt Crain. I think of Kurt Crain. Kurt Crain died yesterday. I really, really wish he hadn’t. 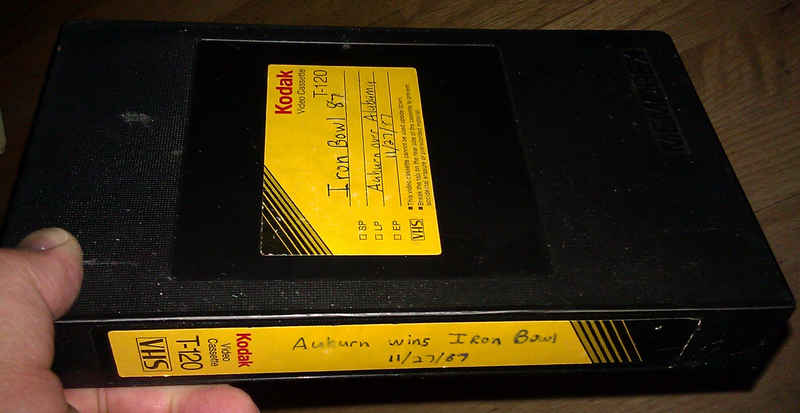 My parents sat with his at the Super Dome for the Sugar Bowl on Jan. 1st, 1988…always was one of my favorite players. Truely sad. War Eagle Forever Kurt! Keep Susan, Jake, Shelby & Blain in your prayers. They lost a husband and a daddy yesterday. So many of us lost a friend. And yes, he was a hell of an Auburn man!!! RIP Kurt. Great tribute to an Auburn man. It is so hard to understand why someone who was such a great inspiration to others could not save himself. Great column … and thanks for posting the video, too.